Now that Congress has turned a cold shoulder to a bailout, here's what the failing automaker should do next. NEW YORK (Fortune) -- Nobody from Detroit got a particularly warm welcome in Washington last week, but the reception was coolest for General Motors, the largest and most vulnerable automaker. As GMers admit off the record, Chairman and CEO Richard Wagoner turned in a dismal performance during two days of congressional testimony. He served up the same kind of boilerplate that GM (GM, Fortune 500) has been offering analysts and journalists for months: We promise to make better cars, more economical cars, more alternative fuel cars. And he presented a laundry list of steps the company has taken to regain profitability, like reducing manufacturing capacity, suspending dividend payments and eliminating health care coverage for salaried retirees. But with a straight face, he blamed GM's problems not on its products, its business plan or its long-term strategy but on "the global financial crisis." He didn't bother to acknowledge that GM has lost an astonishing $72 billion in the past four years on his watch - including $51 billion before the crisis hit in 2008. Wagoner also flunked the public relations part by arriving in Washington on board his corporate jet - couldn't he at least have hitched a ride with Ford (F, Fortune 500) or Chrysler? - and failed to step up when asked to demonstrate a sign of financial sacrifice. With the company in danger of running out of cash before the inauguration of President-elect Obama, what should Wagoner do now? Start burning the deck chairs. GM needs to make some visible and effective efforts to cut costs and raise cash. Mounting a bare-bones exhibit at the Los Angeles auto show is a start. But GM has been dangerously slow about identifying surplus assets like Hummer and putting them up for sale. Show some sacrifice. GM is currently planning to go ahead with its scheduled Christmas shutdown from Dec. 24th until January 5th. That's great - GM employees will be on paid holiday while the rest of us are working. GM should get them back to their jobs and have them come up with more ways to raise cash. Develop a plan and sell it hard. Wagoner tried to bluff the government into a bailout without showing any of his cards. That didn't work, so now he needs to up the ante. When Chrysler was on the ropes in 1979, CEO Lee Iacocca put together a display of new models and took it on the road to demonstrate that Chrysler had a future. Wagoner needs to do the same thing. He's working on it. 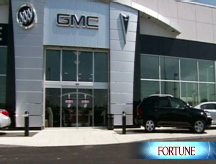 A GM spokesman says, "We intend to deliver a plan to Congress that shows them a viable General Motors." But what is GM's future? Certainly not as a manufacturer selling eight - count 'em eight - brands of cars at a time when Toyota (TM), its closest competitor, gets by with three. GM needs to address that issue immediately, even if it secretly believes that eliminating brands and their dealers is the wrong thing to do. Some have suggested that GM become, in effect, an arm of the federal government, performing the energy independence work that Obama has promised. But having seen GM fail at profitably making and selling automobiles, something it has been doing for 100 years, I'm frightened about the possibility that it should try its hand at something new. By now, it is clear to almost everyone that the U.S. doesn't need three independent car companies any longer. There isn't enough business for all of them. What Wagoner should do is design a new structure that will allow the three of them to combine forces. It is clear that Cerberus is anxious to give up its ownership of Chrysler at any price. The hard part will be convincing the Ford family to relinquish its control of Ford Motor. Here is how Wagoner can do it: Looming in 2020 are stringent new federal fuel economy regulations that will require cars that get 35 miles per gallon. The current mandate is 27.5 mpg. Meanwhile, California and a dozen other states are licking their lips in anticipation of a waiver from the Environmental Protection Agency that will allow them to demand cars that get 43 miles per gallon. Having underinvested for years, it is going to be exceedingly difficult for Ford to meet that target. But by sharing technology with GM, it may have a chance. If he can turn the Detroit Three into the Big One with a new environmental mandate, Wagoner will have developed a compelling rationale for a Congressional bailout. It is worth a shot. Nothing else has succeeded so far. Kick GM out of the Dow...now!